How does the Village Design Statement tie in with the Conservation Area and the village envelope? There is often confusion between the policy affecting development in a designated conservation area and the guidelines affecting development in a village which has adopted a Village Design Statement. The conservation area of Stillingfleet is designated by Selby District Council. In Stillingfleet it includes the village green and most of the houses overlooking it. The scale, form, position, design and materials of new buildings are appropriate to the historic context. The proposed use, external site works and boundary treatment are compatible with the character and appearance of the area. THE COUNCIL WILL REQUIRE APPLICATIONS IN SENSITIVE PARTS OF CONSERVATION AREAS TO BE ACCOMPANIED BY DETAILED PLANS AND ELEVATIONS SHOWING THE PROPOSED DEVELOPMENT IN ITS SETTING. Because it is Council policy, contained in a Local Development Document, all persons developing or altering property within the conservation area are bound by what it says (and so is the Council). The purpose of the Village Design Statement is set out on page 1. It is not a policy, it is a Supplementary Planning Document which is intended to provide advice and guidance to anyone wishing to develop or alter property anywhere in the village of Stillingfleet. (including development within the Conservation Area) However, it will be particularly useful for those wishing to develop property within the Conservation Area because it sets out a working definition of the “character and appearance” of Stillingfleet ,which is an essential part of Policy ENV 25. 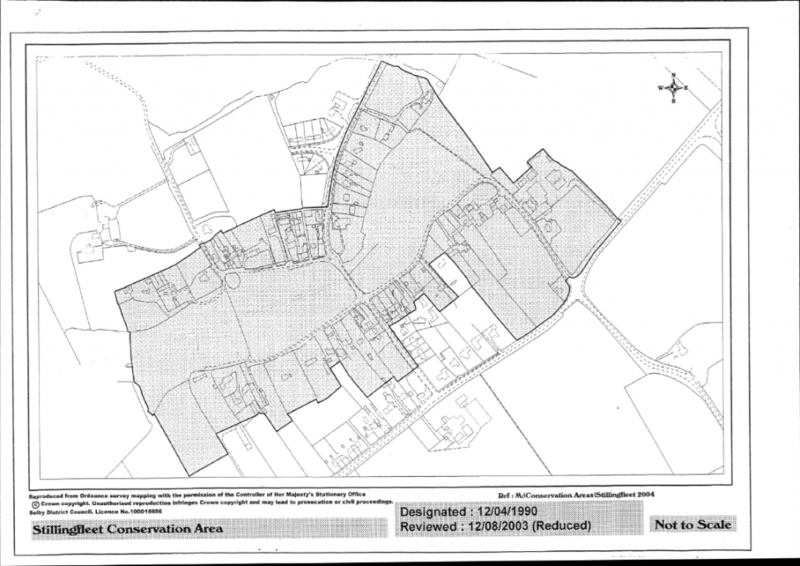 The village envelope is an area defined by a dark line on the plan below in which development is permissible providing it is approved by the local planning authority. Any such development will be affected by the policies relating to conservation (if within the conservation area) and to the guidance set out in the VDS.